It’s bound to happen from time to time: moms get tired. We become worn out, and Lord knows we need a break. Earlier this year when I was suffering from severe adrenal fatigue, insomnia hit like a ton of bricks and I became a “mombie,” aka: really tired mom. I got desperate to sleep better. I was taking forever to fall asleep and, occasionally, I had nights where I was awake more than I was asleep. If I was awakened by a child (or husband, ahem) soon after falling asleep, my heart would race and my system would go into a bit of a shock. Forget about falling back asleep anytime soon after that. I would often wake up through the night and have trouble falling back asleep then, too. I couldn’t get through the day without a nap and spent my days stumbling around haphazardly. I know zombies aren’t real, but y’all, if they were, you’d have mistaken me for one. I had to figure out a way to sleep better. I decided to try some herbs I knew were effective for inducing restful sleep. This stinky herb has been used historically to help with insomnia, as well as calming, and has even been shown to help with symptoms of obsessive compulsive disorder. While I typically prefer to use herbal extracts and tinctures because of their easily-absorbed nutrients, I refuse to take valerian in tincture form. I’m not lying when I say it smells slightly (ok, a lot) like a dead… something. But- it IS effective for calming the nervous system, relieving tension and inducing sleep. Valerian root helps me sleep better. Get it here. Last year I learned about passionflower, and how it soothes the nervous system. It can be especially helpful for kids with hyperactivity, as it increases GABA (gamma aminobutyric acid) in the brain, which inhibits stimulatory neuron activity. It is a very calming herb, that has been shown to help with anxiety as well. When I added it to my nighttime herb routine, I noticed right away that began to I fall asleep faster and sleep better. Since passionflower has a light, syrup-y taste, I’m happy to take it in liquid form. Get it here. Aside from the fact that I adore the earthy smell of lavender, which really makes me inner hippie child burst into song, I love the calming, soothing properties of the herb. I had a lavender tincture on hand from my herbalist friend, which I had bought in hopes that it would be calming for my hyperactive kid, as well as help my occasional headaches. Lavender helps to relive tension, and can help with anxiety. It was the perfect compliment to my herbal repertoire. Get it here. I decided to hit my insomnia with all of the calming herbs I had on hand, in hopes that I would soon sleep better. I was amazed to find that the combination worked wonderfully, the first time I tried it! Note: these dosages are for the exact products I’ve linked. Change in strength changes my needs, and I’ve had to increase my dosage when I’ve used different brands and strengths. These brands and dosages work great for me. 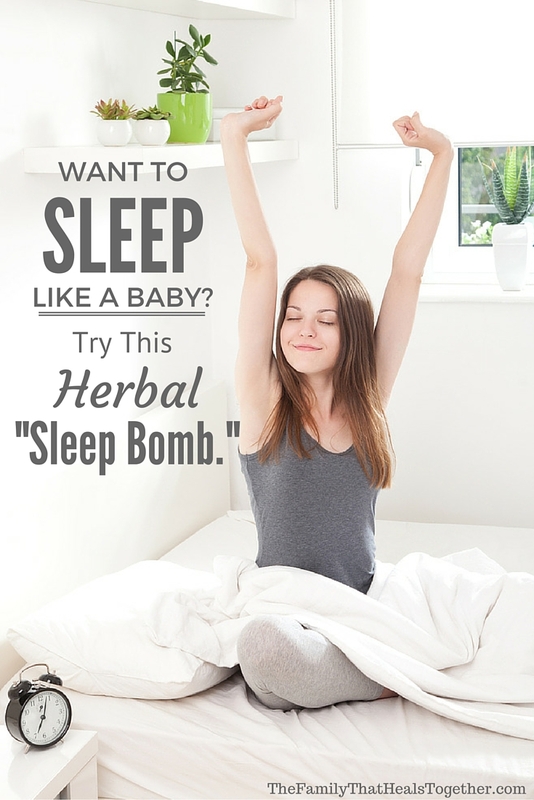 I take this herbal “sleep bomb” 30 minutes to an hour before I plan to go to bed, and I get sleepy by the time I hit the sheets. It is such a relief to not toss and turn, waiting, no begging for sleep to come. I have been using this combo of herbs for about five months, and I have had a huge improvement in my quality of sleep. I just sleep better when I make sure to take my herbs. Plus, if I run out of any one herb, the remedy is not as effective; I’ve found that the combination of the three is really the key to helping me sleep better. Avoid sugar and starchy foods in the evening. Turn off electronics and/or use blue light blocking glasses in the hours before bed. Wind down before bed; try taking a hot epsom salt bath, reading, or even coloring. Do you struggle with trouble sleeping? Please share using one of the links below to help your friends sleep better too! I have Valerian Root extract and don’t mind it. Do you have any idea what the measurement to the extract would be instead of the two capsules you have on your instructions? Thank you for your help. Hi Bertha. Without knowing what kind of extract you have, I couldn’t compare the two. The capsules I take have 800 mg valerian root and 200 mg valerian root extract in two capsules. You can compare that to a dosage of your extract to figure out how much you should take. Hope that helps! My trouble is staying asleep. Guess it can’t hurt to try and see if I sleep through the night. Thanks for the info. Hi Jacklyn, I’m not able to get a link on any of the product you are using. Hey Lori. I’m not sure what the problem might be, as the links are working on my end. Did you click where it says “here” following which products I use? So sorry was trying it were you say the amount . I found it thank you. How do you take the tincture? Do you mix it with water or just take it as if it was medicine? Thanks! Yes, I put it in a little water. I would love to get a hold of these herbs to try to help my husband with his insomnia. The lavender tincture appears to be linked to a site that is now closed. Have you found a different brand (and maybe dosage) of lavender that you currently use? Or do you have any other suggestions for replacing this item? Thank you! 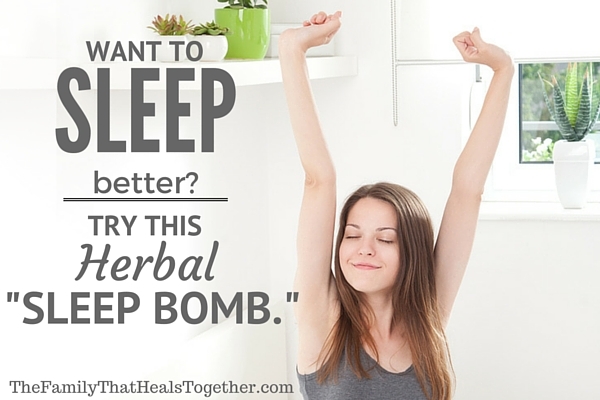 We look forward to trying these herbs for better sleep! Hi Aimee. I’ve updated the post to link to a similar product. Hope that helps!